Is This the Best DJ Controller Under $400 Currently on the Market? 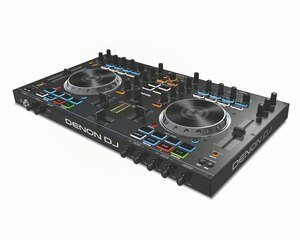 I have had a Serato DVS setup for a couple of years but I recently decided to sell my Denon DS-1 DVS box and go for a DJ controller instead. 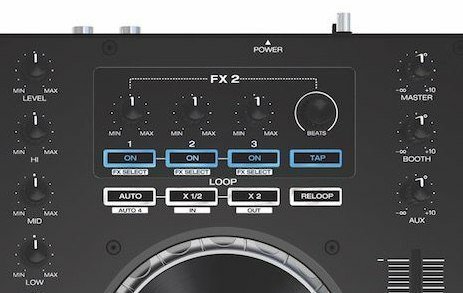 I was initially looking at Pioneer's DDJ-SB/DDJ-RB range of entry-level controllers but I was uneasy about some key limitations of those. I went with Denon MC4000 in the last minute, and I'm really glad I did! Here is my review of the controller after using it for about a month. A lot of the MC4000 reviews that I read mentioned that it's a truly businesslike, professional controller, and I have to say that it's the first thing that jumps at you once you unpack the unit. The build quality is very good with a dark metal top, and the controller feels heavy and sturdy. It doesn't project quite the same "built like a tank" feeling like, say, the Technics SL-1200 decks, but it's still reassuringly solid. The bottom and the sides of the controller are plastic. My unit came with a slightly loose and squeaky bottom cover but it doesn't seem to be a big deal. A glance at the MC4000's controls will tell you that the controller was created with a no-nonsense, probably mobile, DJ in mind. 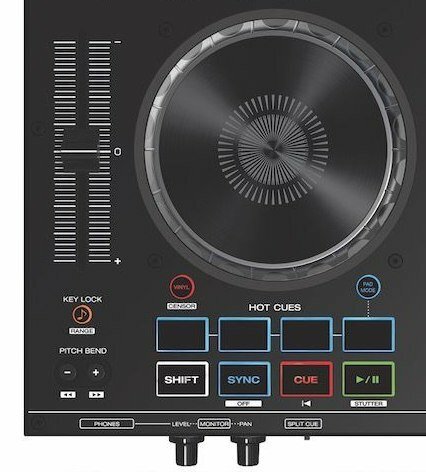 The product clearly isn't trying to win over a beginner DJ's heart by offering cool (but often useless) bells and whistles, but it shines in ticking a lot of the boxes for the working DJs out there. The first no-nonsense feature of the MC4000 that comes to mind is the full-sized pitch sliders. 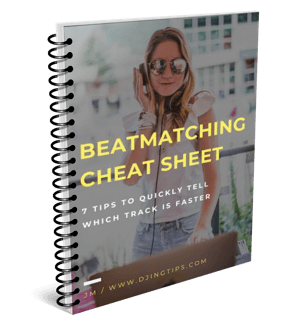 I beatmatch by ear a lot so it's important for me to be able to make fine pitch adjustments. Unlike the toy sliders found on a lot of other controllers in today's sync-first day and age, the MC4000's ones allow me to do that. Speaking of the pitch sliders, the MC4000 seems to have an oddity that could be a firmware bug or just a plain engineering oversight. When the pitch range is set to +/-8%, moving the slider all the way down sets the pitch to +8% as expected. However, the +4% point is considerably closer to the zero than halfway between 0 and +8%. I rarely care about the absolute pitch value so it's not a deal breaker for me, but having such a "pitch slider curve" in place is still strange. Another MC4000's practical feature that I appreciate is the Cue Mix and Split Cue controls. I practice mainly in headphones, and I used to make heavy use of the Cue Mix knob on my old analog mixer when beatmatching and during track transitions. The MC4000 offering Cue Mix (as opposed to, for example, the Pioneer DDJ-SB3) was a big plus for me. Along with Split Cue, that just makes the Denon controller much more headphones mixing-friendly. The controller's jog wheels are excellent, very sturdy and without any sort of "give". I'm no scratcher but I'm used to handling vinyl and the MC4000's jog wheels provide very good approximation in vinyl mode. The controller also offers pitch bend buttons for those old-school pros who are more comfortable using them that the jog wheel for "nudging" the tracks. I already mentioned that the MC4000 is seriously aimed at mobile DJs. The connectivity it offers is pretty impressive. The controller has 2 mic inputs with EQ and volume controls for each, an XLR as well as an RCA master output, and a booth output. There's also an RCA aux input for a backup sound source, e.g. an iPhone, and two headphone outputs (3.5 and 6.5 mm). The controller doesn't let you control the 3rd and 4th virtual decks as some other competitor products do. While not a showstopper for me, you may want to take that into account when choosing a controller. The MC4000's mixer section features the standard three-band channel EQs along with a gain knob and a dedicated filter knob for each channel. The level meter in the center doubles as both a master and cue meter. When no channel is cued, both parts of the level meter show you the master output level. And when a channel is cued, the corresponding part of the meter shows you the gain level for that channel. There's an FX section for each virtual deck that lets you assign up to three effects and has a separate level knob for each, which is pretty cool. The library section in the top center is very well thought trough and lets you switch between Serato's panels, scroll through the lists and load tracks into virtual decks without having to touch your laptop. Separate volume knobs for Master, Booth and Aux outputs are provided. Again that's something that a no-nonsense working DJ would certainly appreciate. The MC4000 is a Serato-only controller and, at $399, it's a bit more expensive than some of the entry-level controllers, e.g. those in the Pioneer's DDJ-SB/DDJ-RB range. Then again, the MC4000 is certainly not an entry-level device. To further offset the price difference, the controller comes with a 50% coupon code for Serato DJ Pro. Since I don't recommend DJing with "lite" or "intro" versions of DJ software anyway, that's essentially an instant $60 off of the unit's price right there. Overall, I couldn't be happier with my purchase. 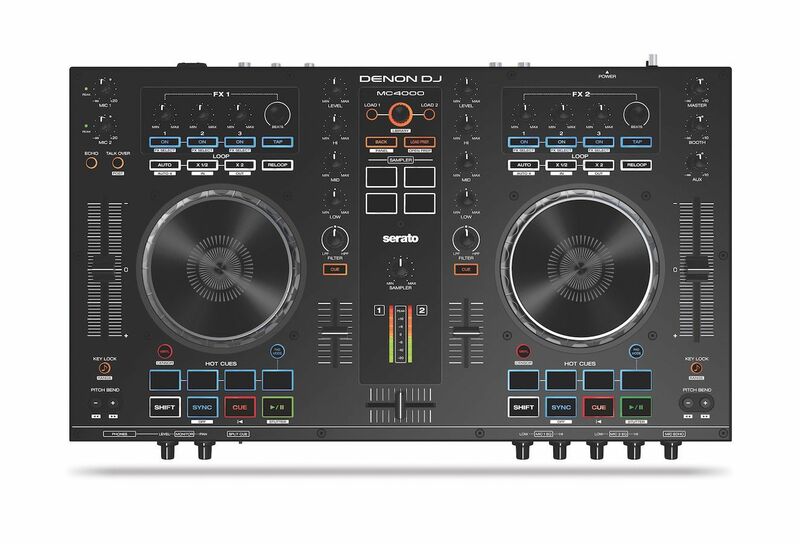 The Denon DJ MC4000 offers excellent value for money and is a full-featured, well-built DJ controller that I'm sure will serve me well for a long time to come. Are you in the market for a new DJ controller? What's your budget, and what models are you considering? Spill the beans in the comment section below! Pros: Very good build quality, full-sized pitch sliders, Cue Mix and Split Cue controls, excellent jog wheels, separate level knobs for FX, impressive connectivity. Cons: Funky "adjustment curve" of the pitch sliders. Bottom line: An excellent Serato controller with just the right feature set for the working DJ.